Share the post "Fibroids and Infertility"
It’s a medical fact that most women will have fibroids during their life time. Usually, fibroid development occurs when a woman is in her thirties and forties. In the past, women of this age would have already completed a family. But today, many women have children later in life. It’s common to start a family in your thirties or even forties, rather than in your twenties. This makes understanding the potential relationship between fibroids and infertility very important. Let’s start with the positive part. Many women will have fibroids that won’t hurt their chances of having children. The fibroids may stay small, or occur in areas that don’t affect the reproductive system. But certain fibroids will have a profound effect on the ability to conceive, stay pregnant and carry a baby to term. Depending on where they are located, fibroids may prevent sperm and egg from meeting for conception. Fibroids can hamper the ability of an embryo to implant. They often grow in places or to sizes that make it challenging for a pregnancy to continue. Fibroids may even affect the health and welfare of the fetus. How do fibroids hurt the ability to have a baby? The answer has a lot to do with where in the uterus the fibroids are located. Fibroids that block the Fallopian tubes can make the journey of a fertilized egg to implantation difficult or impossible. You have fibroids. You want children. Now what? If you are already pregnant, you want to be sure any fibroids present are monitored by your OB/GYN. Sometimes, as the baby grows, so will the fibroids. This can create issues for pregnancy and delivery. It’s important that your pre-natal care includes a sharp medical eye on existing fibroids and their development. If you have fibroids and are trying to get pregnant, it’s important to discuss with your doctor whether the fibroids are in places that might prevent you from doing so, or are in places that could cause complications in pregnancy. If so, fibroid treatment is usually recommended. If my best chance for a successful pregnancy is fibroid treatment, what are the options? Removing fibroids to improve the chance for conception and pregnancy may be recommended to you. Often, a doctor will suggest a surgery called ‘myomectomy’. Myomectomy cuts out existing fibroids. While this form of fibroid removal is fairly common, it has several drawbacks. Surgery to the uterus may cause scarring. Uterine scarring can make the successful implantation of an embryo problematic. If any part, even a few cells, of a fibroid are left behind, that fibroid will have a 50% chance of regrowth within a period of about 10 months. This makes your window of opportunity for conception and pregnancy very limited. If you have a myomectomy and don’t get pregnant fairly quickly, you could wind up facing multiple surgeries as fibroids repeatedly grow back. Surgery to the uterine walls can also weaken them. Sometimes, this compromises carrying a baby to term and/or its delivery. Is there a non-surgical approach that ends fibroids and aids my fertility? Yes. It’s called Uterine Fibroid Embolization. Embolization shrinks fibroids instead of cutting them out. It is a minimally invasive, non-surgical procedure. It works by blocking the blood supply to each fibroid, ending its ability to thrive and grow. Embolization doesn’t involve cutting or cause any scarring. And embolization is extremely precise. It addresses only fibroids, leaving all other tissue healthy and whole. As the fibroids shrink, so do the fertility problems they create. Uterine Fibroid Embolization isn’t just a proven, non-surgical solution to fibroids. It’s an excellent option for women who want to have children. 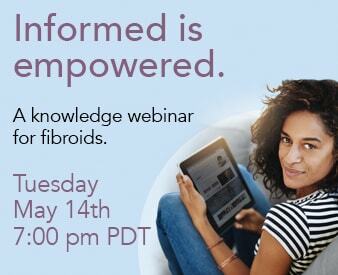 Embolization affects only fibroids. The uterus and reproductive organs are left whole, uncut and without scars. Embolization ends fibroid growth permanently. Fibroids won’t grow back. Your window for conception and pregnancy is much greater than with a surgical treatment. Embolization doesn’t weaken the uterus or uterine lining the way surgery often can. Embolization isn’t surgery. The discomfort, risks and recovery time are significantly less than with a myomectomy. Listen to embolization patients who now have children here.